The disappearance of young Avonte Oquendo in New York City (NYC) reminds me again of this critical issue for many, many parents of children with autism and developmental disabilities. I recall Ryan’s most serious incident when he wandered off as we shopped in the Notre Dame Book Store. Ryan was missing for only five minutes, but those were the longest five minutes of my life. I felt a surge panic, but had to remain focused to begin finding him. My story and helpful hints are in Safety Measures for a Wandering Child. Today, the search for Avonte continues. I’m sad for his family as I understand the waves of panic, hope, and fear that they are feeling, although Ryan was gone no longer than five minutes. I’m also proud of the NYC community supporting his family. New York has come together in the quest to find Avonte. They are doing everything right. The man power being used for searching, focusing on his interests (trains) for that search, and being willing to stop the subway in the search is an amazing and profound example for all communities. Social media is keeping the search efforts at the forefront of everyone’s mind. The Facebook page is Bring Avonte Home. Follow the child and call the police. Don’t approach the child. You may be inclined to do so, however this might encourage the child to run. Trust your gut that it might be the child, keep following, and stay on the phone with the police. It only takes one second for a child to wander. The statistics in my post Children with ASD and Wandering: A Compelling Research Study show that often, for children with special needs, it is not a deliberate act of choosing to run but simply that the child sees something that catches his or her interest and wanders off to look. This event also reminds me of the importance of registering a child and or family with Safetown.org. I’d strongly encourage everyone to investigate whether your community is registered with Safetown.org. The form itself only takes a few minutes to complete and it could save your child’s life! 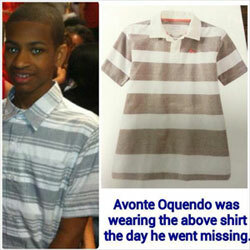 Prayers go out to Avonte, his family, and the NYC community as the search continues. This entry was posted in Uncategorized and tagged asd, autism, autism awareness, autism issues, Avonte Oquendo, prayers for Avonte, Queens NY, special needs, tips, wandering. Bookmark the permalink. Oh, Lord. This is so scary. Any parent’s worse nightmare.